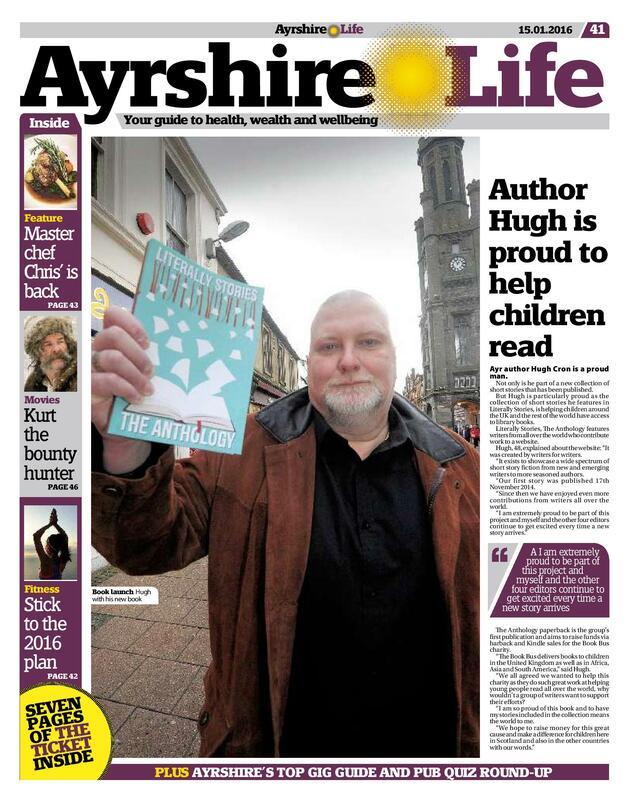 Literally Stories Editor, Hugh Cron, met with The Ayrshire Post journalist, Lorraine Howard to discuss the Anthology and our charity The Book Bus. When Literally Stories threw open its virtual doors on 16th November 2014 we had no idea what we were letting ourselves in for. A lot of hard work as it turns out. We published our first story, Post, by Jenny Morton Potts. A year later and somewhere not too far south of reading 1 MILLION words in all the wonderful stories that landed in the LS mail box, we remain very proud of our site. Our writers. Our, ahem, eclectic oeuvre. Up to this week ended *9 October 2015 we have published 225 stories written by 77 authors from all over the world; science fiction, fantasy, historical fiction, every conceivable type of general fiction, even the odd romance. Stories whimsical, stories that make you wonder, cry, laugh, despair and sometimes hope. Whilst publishing has been a labour of love, deciding upon just forty or so stories to appear in this, our first anthology, has in truth caused a few heated debates. We’re still friends you’ll be pleased to know. Finally we arrived at Literally Stories – The Anthology. The e-book goes on sale 16th November 2015. We hope you buy it. Tell your family and friends to do the same. So do The Book Bus — a UK based children’s literacy charity working primarily in Africa and South America, as all proceeds from the sale of this anthology go to them. *stories published up to Friday 16th October 2015, 230 in total, have been considered for inclusion.